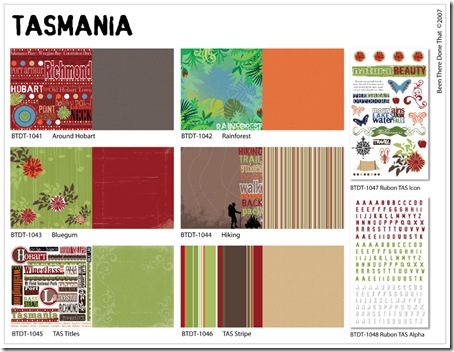 The greens and browns of the wilderness - the hues of the rainforest - a very outdoor camping theme dominates the tasmanian papers. Not that they stop there - as with all the states the strength of these papers lies in their versatility - here you'll see we showcase holiday snaps, girly, boy-ey, - even Christmas can work perfectly. We thank guest designers Nicole Aspinall, Tania Davey, Petrina McDonald, Jenni Hudswell and Carole Janson alongside our own design team. 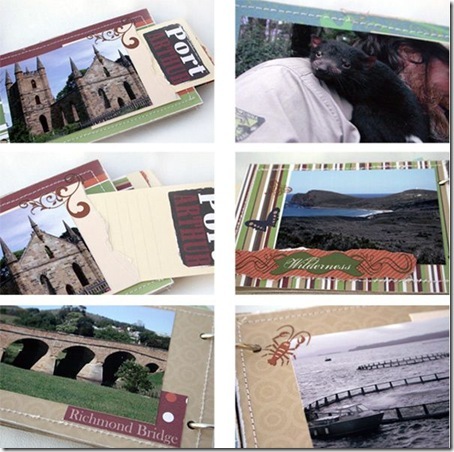 As you'll see, BTDT papers are perfect for your travel photos, but they are perfect for other topics as well. 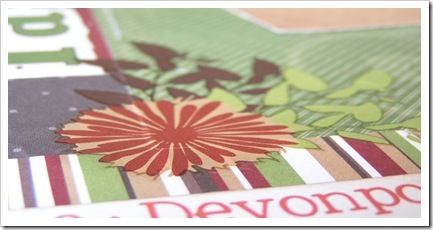 It was the rich colouring in the TAS papers that made Nic put up her hand for this range first, with the deep rich greens, reds and oranges being a current favourite colour scheme. 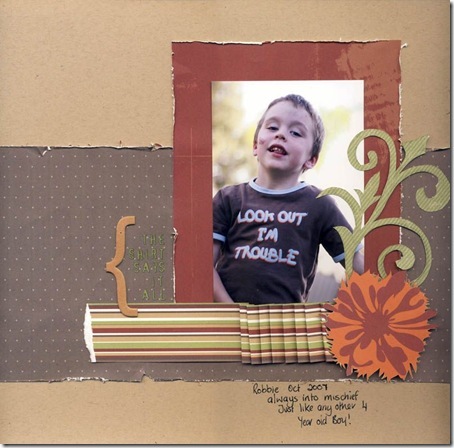 These colours matched perfectly with a baby photo Nic and she shows beautifully how the BTDT papers are quickly and easily adapted to any any theme! Note that although the base paper has hiking phrases and words on it, Nic has used it anyway - and it looks fabulous. The sprinkling of undefinable words and colour down the side is perfect. 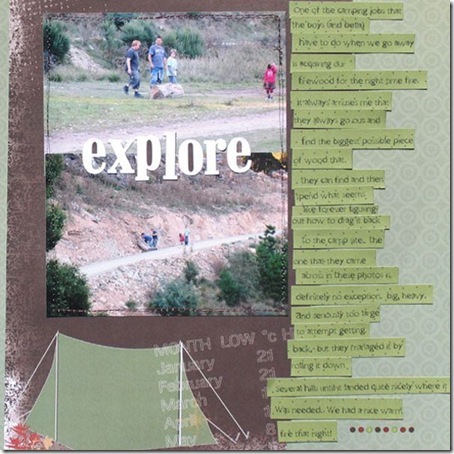 The camping out paper was perfect for these photos that Mel had been putting off scrapping. The little tent sits nicely at the bottom of the layout, immediately symbolising that these are camp related photos. The strip journaling down the right hand side helps to balance the page. Chris has cleverly cut the letters 'Rich' from the title 'Richmond' on the 'Around Hobart' paper to create a title for her page. 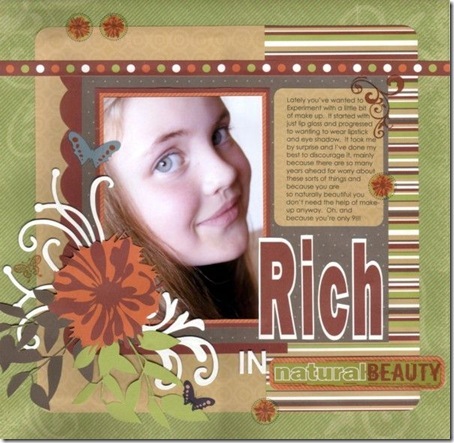 The earthy tones definitely lend themselves to accompany this lovely, natural looking photo of Chris's daughter Shayla. 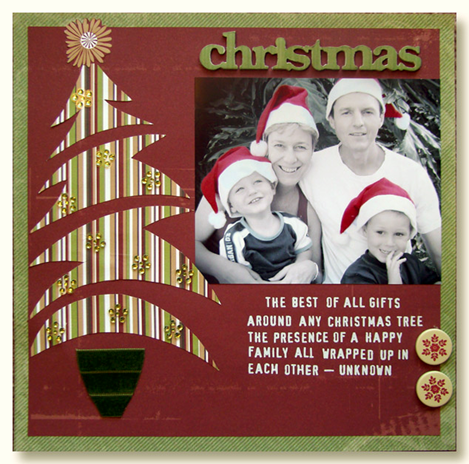 Cheryl straightaway saw Christmas in the Tasmanian papers and desaturated a Christmas family photo to just the red christmas hats to work with it perfectly. The inspiration for her tree was a BasicGrey chipboard shape and cut out in the Tasmanian stripe it's a simple but perfect embellishment. 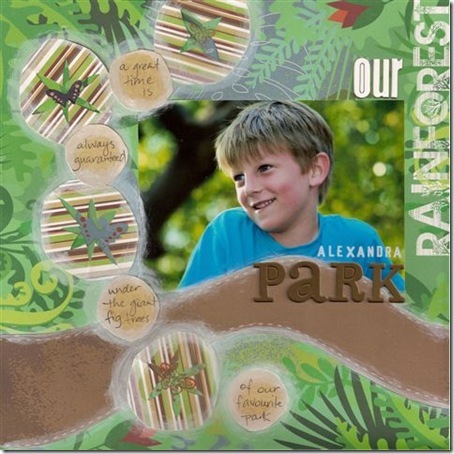 Carole Janson: I used the Tasmanian Products for this layout (Papers and rubons). 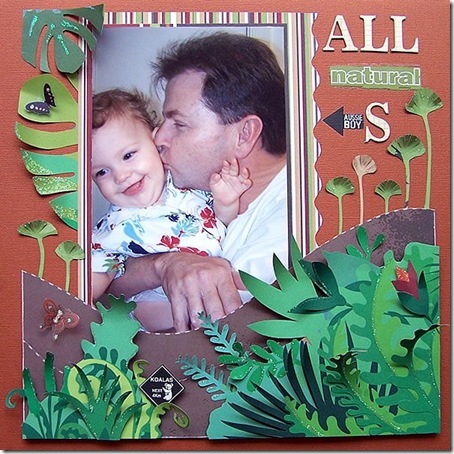 This is a great photo of my husband and my son - my two Aussie boys and these papers worked really well with the photos. 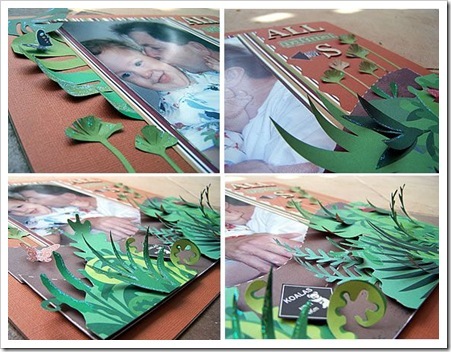 I curled and 3D the papers and added 3D butterflies and rubons. Jenni Hudswell was another who looked at these papers and thought 'finally'. holiday snaps from her honeymoon 10 years ago are making it out the box. 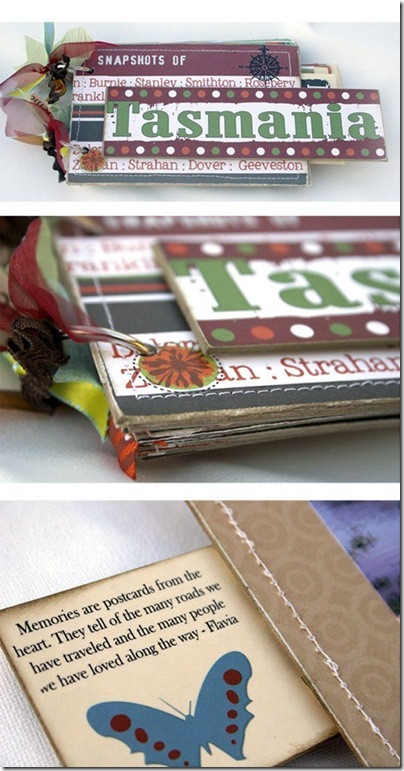 Jen has layered several of the papers here, scalloped edges and stitched and still the page doesn't look too busy. She has cleverly circled the placename of the town where they stayed. Jenni Hudswell - another great use of the papers - the blue of the sky in these shots stands out perfectly against the colours of the papers. 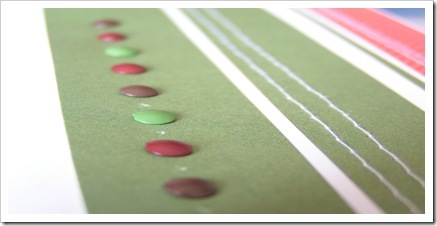 We love how she has reflected the colours of the dots in the rubons with brads. 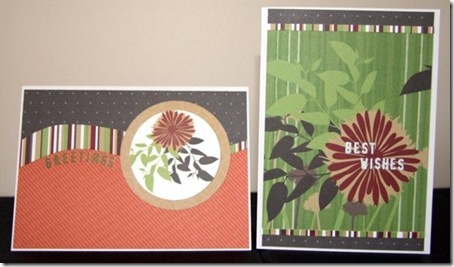 Nicole Aspinall: I found these papers so easy to work with because of the coordinated stripe, dot, patterns and plains. With plenty of patterned papers suitable as background options and beautiful elements in the rub ons (I love the butterflies which I highlighted with a white gel pen to make them really stand out) I found I didn’t even need to use any other products on my projects. 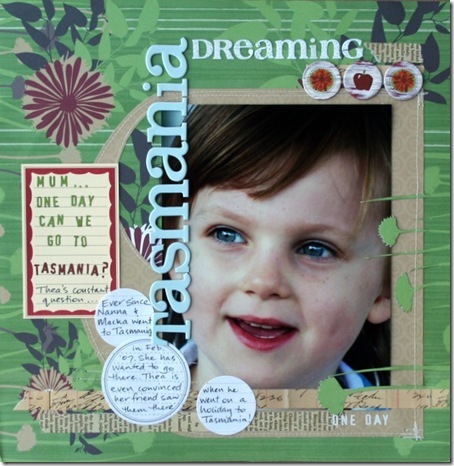 Petrina McDonald: Even though I have never been to Tasmania - a layout about the apple isle was easy for me because my daughter does not let up on her desire to go there. This kid thinks about going to Tasmania like a regular kid thinks about going to Dreamworld! The constant question, "One day can we go to Tasmania" is one of those ones we get all the time in the car. My parents spent two months camping in Tasmania at the beginning of the year and they enjoyed it so much that Thea thinks it would be a great place to visit - maybe one day she will find out for herself! Petrina McDonald: "In the absence of any actual photos of Tasmania, I looked through photographs that I had which suited the papers for this state. Instantly the "rainforest" paper was a stand out to go with this photograph of my son playing under a giant fig tree in our favourite park. This part of the park is like a rainforest with the sun only filtering through in parts - and we always need our insect repellant - just like a real rainforest! I don't often use "themed" papers so it was refreshing and fun to incorporate the text on this paper into my title." Tania Davey: The rich browns and reds on the reverse side of the Tasmania papers, work really well for masculine pages. I cut some of the images out of the papers, the flower and the scroll, I pleated the striped paper for some added texture. 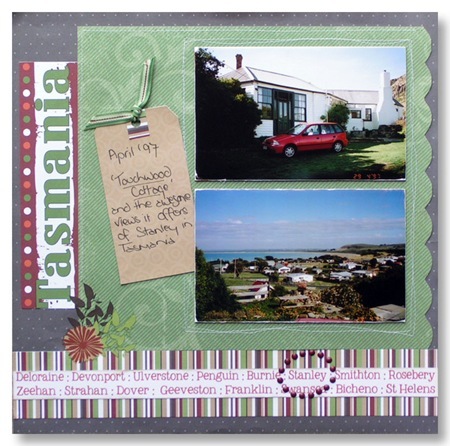 Tania Davey: I have never been to Tasmania, but I have some close friends who have just recently been, So I asked them for their favourite photos of their trip, and I have created a Mini album for their pics. I have torn pay envelopes in half to create little pockets for the altered Jenny Bowlin Journaling cards. 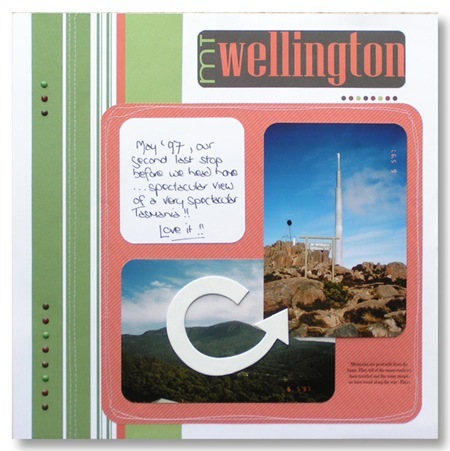 I haven't written on the journaling cards, I will leave that for Mick and Donna to do to record their memories of these gorgeous Places. 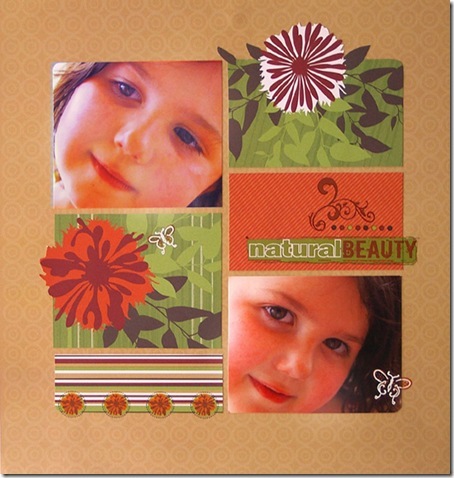 Nicole Aspinall: I love the warm earthy tones of these papers. Perfect for a couple of simple ‘Bush Christmas’ cards. 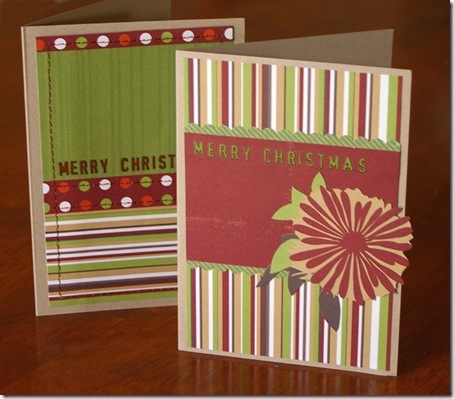 And finally Chris Millar uses up her scraps on these two lovely greeting cards.